“The Magic of the Gospel” is the title of our Mothers’ Union talk on September 27th. The speaker will be the Rev. Gwyn Murfet whose talks have proven to be very popular. M. U. meetings start at 2.00 P.M. and are generally on the last Thursday in the month except when they clash with holidays. Everyone is most welcome at St. Andrew’s church. This entry was posted in Mother's Union on August 2, 2007 by smileangel. 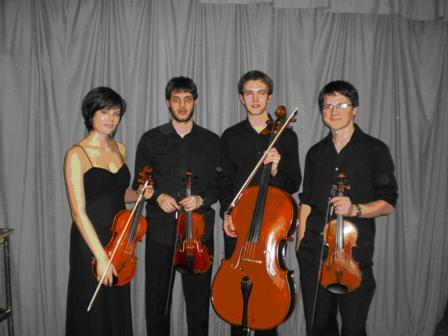 On Saturday, 1 September, at 7:30 the Milner Quartet is giving a charity concert in aid of St. Andrew’s Church. In addition to playing chamber music, these young musicians hold places in the National Youth Orchestra, and Derbyshire and Sheffield County Youth Orchestras. Come and support St. Andrew’s Church in what promises to be a very enjoyable evening. Entry is free with donations taken on the night. This entry was posted in Special Events on August 1, 2007 by angelweb. This Sunday we will experience a treat! A group of 19 students between the ages of 16 and 20 have been working together to develop their leadership skills. Not only have they been restoring paths for the National Trust, but they have been planning a programme for our St. Andrews service on Sunday. Last year it was so full of energy we were exhilarated the whole day long. Don’t miss this great opportunity at 11 a.m. this Sunday! This entry was posted in Services on August 1, 2007 by Arkangel.